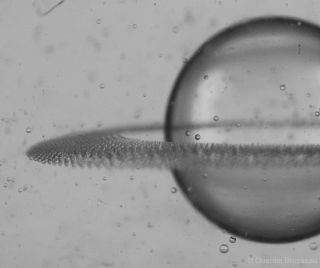 Rings of droplets formed from the equator of a drop after application of an electric pulse. Though gorgeous to look at, the resulting "planet" has more than aesthetic value: The achievement could help lead to new ways of generating microscopic and uniform particles and capsules often used in products such as drugs, inks, cosmetics, paints and ceramics, researchers said. When an electric field is applied to a drop of silicone oil suspended in castor oil, the drop can flatten and emit rings of droplets from its equator. Experiments regarding this effect, known as electrospraying, often involved drops of liquid surrounded by less electrically conductive fluids. In the new study, senior author Petia Vlahovska, an engineer at Northwestern University in Evanston, Illinois, and colleagues wanted to explore what happens when drops of liquid are submerged in more electrically conductive fluids — specifically, drops of silicone oil suspended in castor oil. These new findings reveal that when a drop is less electrically conductive than its surroundings, its poles take on an electric charge that is the same as the electrodes (the electrified plates). Since like repels like, "the repulsion between the electrodes and the poles squashes the drop into [an] M&M-like shape," Vlahovska told Live Science. If an electric field is strong enough, the researchers found that the equators of these squashed drops emit concentric rings of droplets, making the drops look like miniature versions of Saturn. In experiments, drops of silicone oil about 1 millimeter wide generated droplets that were about 100 times smaller, Vlahovska said. "I was surprised by the fact that rings detached from the drop — I was not expecting it all," Vlahovska said. When an electric field is applied to a drop of silicone oil suspended in castor oil, the drop can flatten and emit rings of fluid from its equator that break up into droplets. Vlahovska noted they could generate rings in a very controllable way. "You can turn the streaming on and off at will," she said. Future research will explore what materials can be used to produce this "ring of particles" effect. "The broader the range of materials, the wider the applications will be," Vlahovska said. Vlahovska and her co-author Quentin Brosseau at New York University are scheduled to detail their findings online July 20 in the journal Physical Review Letters.